Our February 2014 Mopar of the Month honors go to Jeanne, aka Fastberry, and her 2012 Dodge Challenger SXT, Christeen 16. Jeanne, like many late model Challenger owners, had fallen in love with the throwback styling and classic lines offered up by the reincarnated Challenger. Living in close proximity to a dealership flashed her mind with visions of grandeur every time she drove by...Unable to fight the temptatin Jeanne soon found herself frequenting the lot checking out the latest models, occasionally texting pictures to her husband. She then stepped it up a notch by ditching the subtle hints and began bugging him to pull the trigger on a Challenger. Sadly, he refused. Jeanne, like any good Mopar person, remained persistent and on top of her game. Finally, she decided that simply looking wasn't good enough and she had worked up the courage to take a test drive. Jeanne's husband got a 2-for-1 in getting a killer surprise, stopping the not so subtle hints, and most importantly landing what is probably one of the best anniversary gifts ever! The Challenger's surprise just happened to coincide with their 16th Anniversary. The fact that Jeanne is into Mopars and her husband supports that is clearly indicative that he was a smart man 16 years ago, and retrains that attribute today. As for "Fastberry" the Challenger they picked out was a 2012 SXT dressed in Blackberry. It is a pretty rare color, one that without Jeanne I'm not sure many of us in AAM would have seen in person. You really need to see the Blackberry coat in person to fully appreciate it. With the great acquisition story out of the way, what else sets Jeanne and Christeen 16 apart from the rest? So far the dynamic duo has collaborated to install Silver Strobe Stripes, a Go Wing, and Sequential Tail Lights to the already unique exterior. Under the hood they treated the Chally to a full host of Billet Tech bling including a Purple Catch Can, Killer Glass Radiator Hoses, and the almost mandatory Cold Air Intake, this one of the Air Raid variety. Inside, Jeanne popped tor some Purple LEDs to replace the factory incandescent bulbs. Some of the more complex upgrades were left to the pros. These include the Platinum Dynasty Wheels, which spin around custom painted calipers Jeanne took care of...Sticking to the lower side of the car, Jeanne had a Flowmaster Exhaust system installed. 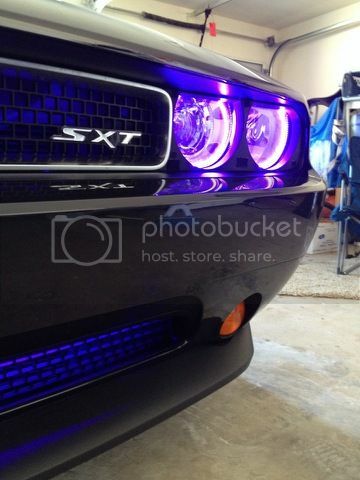 To take things to the next level, she also had Purple Halos installed along with Purple lighting behind the grill, and of course some 70s styled amber fog lights. Most recently she treated her SXT to a Pioneer Head Unit, aftermarket speakers, an amp, and a sub to handle the lows. So, what does a girl do with a tricked out Challenger? Drive the snot out of it and go to shows of course! Jeanne not only hits up the show circuit, including several events here in Amarillo, but she also races the car. She isn't trying to set any land speed records, but like any red blooded American she gets a thrill from the "legal speeding" on the drag strip. She has never dyno'd the Challenger, but would be interested in knowing what kind of power it puts out. She has taken home three 2nd Place Trophys at car shows and has more planned for Christeen 16. Oh, and if you wonder why I said she even makes events here in Amarillo it is because Jeanne is based out of Yukon, Oklahoma. She has been at the last few Chryslers in the Canyon and even made the trip down for the Polk Street Cruise in August. That is dedication and that is something we like to honor and support. So on behalf of all of us in Amarillo Area Mopars congratulations to Jeanne (Fastberry) and her 2012 Blackberry Challenger SXT, our February 2014 Mopar of the Month! If you would like to see your Mopar featured here on Lone Star Mopars, please sign up on the forum and submit your information.